By Jake Rocheleau in Photoshop. Updated on April 4, 2017 . Adobe Photoshop is a powerhouse program that can do photo editing, UI design, digital painting, and even vector work. It takes years to master all the keyboard shortcuts and workflows because there’s just so much to learn. Photoshop Etiquette is a free online guide that can help you find a productive workflow. Note this guide is not a complete intro to designing in Photoshop. It assumes you already know the basics of the software and have the skills to create mockups on your own. Photoshop Etiquette takes that raw knowledge and helps you organize the process for a streamlined approach to UI design. 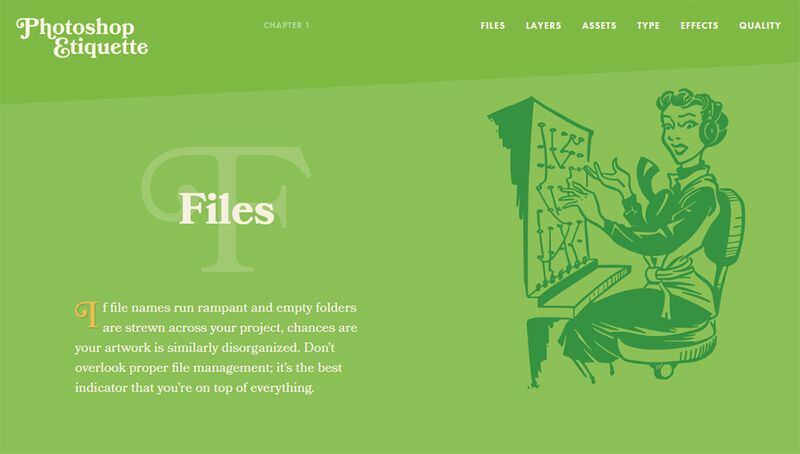 For example, the first chapter on files shares tips to organize your folders and individual files used in a project. For instance, it’s too easy to make small edits and save that file as something like my_site_mockup_FINAL.psd. This is perhaps the worst method for organizing files, and as pointed out in the guide you’ll have much better luck using version control. But you can also organize files manually by versions (ie. v1, v2, v3) if you’re confident enough to distinguish between them. While browsing the site, you’ll notice that after each tip there’s a little yellow info icon. Click that to get a pop-up with more information related to that specific suggestion. You won’t find these icons after every tip, but the ones you do find have great info. Photoshop Etiquette is small and with only 6 chapters it can seem brief, too. However, it’s constantly being updated and you can even submit ideas to be included in the guide. The site’s creator Dan Rose also published a book titled “Responsive Web Design with Adobe Photoshop”. It’s published by Adobe Press, so it’s a quality title and it can help you dive into Photoshop for web design by learning proper workflows right from the start. Even if you don’t need a book to learn Photoshop you can still gather some great ideas from Photoshop Etiquette. If you have some time check it out and see what you think!